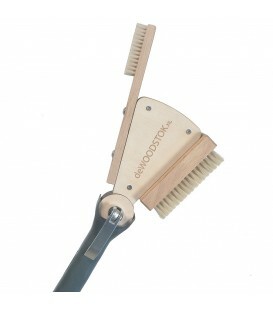 deWOODSTOK brushes are produced and assembled by hand in the Netherlands. All parts of deWOODSTOK have been carefully selected on quality and the birch ply wooden parts are lasercut by Laserbeest in Delft. A standard WOODSTOK comes together with a telescopic stick and a head with two brushes. deWOODSTOK is 1,40m long and 2,28m in it’s extended position. Brush to clean the holds up to eye-level height. This is the perfect brush to do the job! With its wide handle you can deliver the best pressure on this boar hair brush which is custom made in Holland. Adjustable boulder brush on an extendable pole for cleaning holds on boulder problems. A boulder brush, adjustable in angle and height. With the help of two different brushes, every hold can be brushed, no matter its angle or shape.